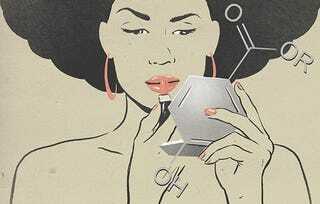 Is Your Makeup Giving You Cancer? In 2012, Shannon Bindler threw away all of her makeup. Bindler is a self-described “life stylist” and the creator of Sole Prescription, a company that specializes in inner and outer make overs. She describes her life passion as the “conscious connection between fashion and spirituality.” Bindler has a master’s in spiritual psychology from the University of Santa Monica and spent the early part of her career as an editor of a yoga magazine. Bindler told me that she’s always been very conscious about what she puts in her body. But it was in 2012, that she became aware of what she put on her body. Why the change? Well, she was pregnant and the swell of her baby and the heightened awareness of her body made her rethink her approach to her skin. She explains, “Your skin is the largest organ on your body and we put lotions and cosmetics on it every day and our body absorbs that.” Additionally, Bindler did a lot of research and became convinced that the phthalates and parabens in her cosmetics were harmful. She points to the Environmental Working Group as a site that ultimately convinced her to go non-toxic. “It just can’t be good to put all those chemicals on our bodies all the time,” she said. So, she tossed her makeup and bought all natural. She hasn’t looked back since. “A bit” is a bit of an understatement. I dug around online and in my local Walgreens to compare the prices and I found that there is at the least a $10 difference between cosmetics marketed as non-toxic and your average drug-store quality makeup, if not more. And it’s usually more, a lot more. But if safety is so important, why is it priced so high? Is being cancer free a luxury of the rich? Is this cancer price gouging or are companies’ just taking advantage of our chemical hysteria? Organic, non-toxic personal care products are a rapidly growing industry. Jessica Alba’s The Honest Company is looking to get in on the action with an organic, cotton tampon (she’s not the only one) and Gwyneth Paltrow is reportedly developing her own organic cosmetics. Although both women claim to be one of us, GOOP makes my wallet shake in fear when I log onto the site and The Honest Company diaper bundle is $79.95 a month. To compare, I pay half of that for my baby’s Pampers shipped from Amazon. And Pampers are on-brand and expensive. There is definitely money to be made allying our chemical fears. In a recent webinar about how cosmetics are made (because nothing sounds fun like a webinar about the product cycle of your lipstick), I was interested to hear Beth Lange, Ph.D., Chief Scientist for the Personal Care Products Council, deride this organic movement as just marketing. The Personal Care Products Council is a trade association with members that range from Almay to M.A.C. So, yeah, they are Big Makeup. They have a stake in settling down these upstart organics. I followed up with Lange about her comments in a separate interview. Unlike Bindler, she has no problem with chemicals. In fact, she laughed as she told me that she earned money in grad school by volunteering as a test subject. “I dumped all those chemicals all over me,” she joked. Lange denies the idea that just because a product is marketed as organic it is safer. “Safety and cost are not mutually exclusive,” she said and referred to the extensive safety testing that personal care products are put through before they can even be put on the shelves. “The FDA considers the makeup industry to be the safest on the market,” she said. In order to figure out whether I was getting bamboozled or poisoned for my poverty, I dug a little deeper into the statistics. After all, if Lange is wrong and Bindler is right, we should be seeing some effects, right? Groups like the Campaign for Safe Cosmetics often tout the relationship between the chemicals found in makeup and breast cancer. So, I dug into the statistics. First off, the United States outspends all other countries on cosmetics. But Belgium has the highest rate of breast cancer of any nation. And Japan, which comes right after the U.S. in cosmetics spending, doesn’t even crack into the top 20 for highest rates of breast cancer. Of course, cancer is caused by a myriad of environmental and genetic factors, both known and unknown. Trying to correlate rates of cancer with cosmetics purchasing is more than a bit unfair. Even if a correlation was there, causality would be hard to prove. Yet, cancer is the big negative outcome that groups like the Environmental Working Group and Campaign for Safe Cosmetics point to when warning consumers about parabens and phthalates. If the threat was real, wouldn’t we see some sort of uptick in cancer rates among women routinely slathering themselves in these allegedly dangerous chemicals? Going back to my original questions about the relationship between cost and being cancer-free, it would appear that no matter what you spend on makeup, you can’t buy your way out of getting cancer. So, if you aren’t buying less cancer, why the cost? One theory is that it costs more to make organic makeup. On the surface, this makes sense. Using naturally sourced ingredients, developing new products that deviate from the standard, that all takes times and money. But maybe not as much as we think. In a previous interview I did with Sharima Rasanayagam, P.h.D., the Director of Science for the Breast Cancer Fund, she and her colleague argue that most of the dangerous chemicals like PEGs or phthalates aren’t necessary and can simply be avoided all together or replaced with only a small impact on the bottom line. They pointed to new, cost-effective methods of stripping harmful by products like 1-4 dioxane. So, are we all being duped? Maybe. But I guess that’s good news, because it means cheapos like me aren’t necessarily more at risk. But I think it’s an important caveat to state that this article just about cosmetics. There are other areas like organic foods and clothing that could impact our wellbeing and most certainly impact our environment. So, I am not suggesting we throw the organic baby out with the all-natural bathwater. The issue is complicated and nuanced. But the bottom line is, all-natural products, whether dirt cheap or GOOP-level prices, are no guarantee of a cancer-free life.